James Sweetnam became CEO of Dana in July 2009 after 11 years with engine component supplier Eaton Corp.
Dana Holding Corp., which has had six CEOs in three years, said CEO James Sweetnam has resigned after leading the supplier since July 2009. Executive Chairman John Devine, 66, will become interim CEO, again, at the axle maker while the board conducts a search for a successor, Dana said. The search committee will be led by director Richard Wallman. Sweetnam replaced Devine at Dana after 11 years with Eaton Corp. He previously had headed Eaton's truck group. When Dana emerged from its two-year bankruptcy in February 2008, Devine became acting CEO, taking over after Mike Burns' four-year stint. Gary Convis, a former Toyota Motor Corp. manufacturing executive, took over as CEO in April 2008. He became vice chairman in November, while Devine again became CEO. 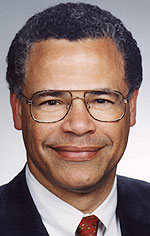 Before joining Dana, Devine held senior executive positions during a career of more than 30 years in the auto industry. He was chief financial officer of both General Motors Corp. and Ford Motor Co.